My answer was always the same. When asked, as a small child, what I wanted to be when I grew up, no hesitation or thought was necessary. I wanted to be a ballerina! 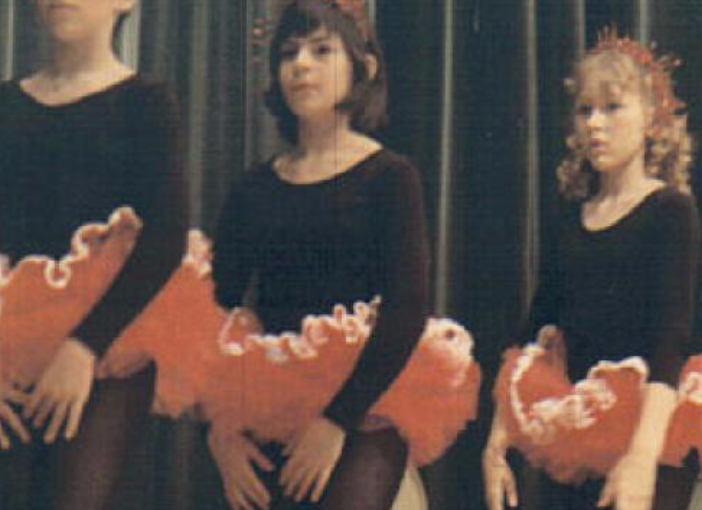 One of my earliest and fondest childhood memories was going to Saturday morning ballet class. I still hear a haunting voice calling out, “plié, rélevé, chassé, rond de jambe, chaînés….”Nothing is still so vivid in my mind, or left such a lasting impression. As far back as I can remember, ballerinas fascinated me. They were beyond perfection; ethereal beings, surely not mortal, as no female form my young eyes had seen was as exquisite and flawless. Even Barbie® couldn’t hold a candle to these heavenly creatures. Like angels or fairy princesses, I believed a magical aura surrounded them. Dressed in silken skirts, flowing with shimmering opulence, or majestic tutus sequined in red, turquoise and gold, their lithe bodies seemed to defy gravity during a grand jeté. Yet more than the glitter, above the glamour, and beyond the enchantment, my foremost preoccupation was with pointe shoes. I earned my first pair at the tender age of six and nothing in my world was better. I think the fact they were so scarce; the only place that sold them was Capezio Shoes, downtown, (Chicago) made them even more irresistible. Opening that box, unfolding the tissue paper to expose two perfect pink satin slippers, square wooden toe and long satin ribbons that tied around my ankles, was better than all Christmases and birthdays put together. I have vivid memories wearing my pointe shoes around the house, trying to “break them in,” or bending them back and forth, to get rid of the stiff unnatural arch. When I wasn’t wearing them, I stared at them, even slept so they were the first things I’d see when I woke up. I was so in love with my pointe shoes, I would gladly have given up candy, ice cream and all my toys to keep them. I probably wouldn’t have traded them even if I never had to go to school again! Every Saturday morning, at 10:00 am, I did pliés, arabesques, frappé, in first position, second position, and sauté, taught by Miss “K.” (I never realized at the time, her last name was actually Kaye) Year after year I danced and when I wasn’t dancing, I was doing cartwheels, handsprings or splits, as acrobatics was a part of the lesson. Eventually I went from a gawky three-year-old child, to a poised and graceful young lady of 15. There were countless recitals and shows. I even had a part in a professional production of The Nutcracker Suite, but the images I recall most are the beautiful costumes and getting to wear eyeshadow and lipstick. I had talent; everyone who saw me dance said so. It wasn’t simply in the mind of an enthusiastic child. I was good. I can’t remember a time where my enjoyment or exuberance faded; I always loved dancing. But as the years passed and my body changed, it became more of a disservice than complementary of a dancer. As a child, I was relatively proportionate in height and weight, but rather muscular from my years of ballet. Since a majority of my friends were quite a bit shorter than I was, everyone assumed I’d grow to be above average height. I know better now that despite a persons stature in childhood, it hardly is a determination of the cards we are dealt as an adult. At the age of 11, I was 4 feet, 11 inches tall, and that is exactly where I remained and to this day, I have never seen the other side of five feet! In addition to my petite nature, I was “blessed” with curves, short muscular legs, no torso and ample hips. In my mind Iwas that slender, long-legged, willowy form, I so envied and worshiped for many years. Yet in reality I had about as much chance pursuing a career as a professional dancer as I would have being a professional model. The buck stopped here. I gave up my dream of becoming a ‘ballerina,’ and went on with my life, though never really loosing the desire or ability to dance. During high school, I always held dance parts in plays and shows, but became more involved in cheerleading and gymnastics. Occasionally; however, I attempted to return to some type of formal dance classes, and took up jazz, modern dance and even belly dancing, but never again did a plié, or donned a pair of ballet slippers. It wasn’t a lack of interest; more likely a lack of confidence. Worse yet, I guess I always wondered, “what if,” and was afraid returning to ballet may open up some very intense and overpowering memories of a time in my life when I was wide-eyed and hopeful, filled with pipe dreams and wishes upon a star. A lifetime has passed since I first stepped into Miss “K’s” dance class. I’ve married, divorced, married again and have three sons, ages 14, 18 and 33. Now at the age of 52, I look back on moments in my life, knowing I haven’t always made the best choices or taken the right steps. Many aspects in my life weren’t what I’d hoped for and many decisions led me down counterproductive paths. The older I became the more my attention revolved around negative factors such as wrinkles, gray hair, loosing the ability to bear children and even death. Yet one day I awoke to a great epiphany; no longer plagued with what was lost. I finally realized as I grew older, I grew better and gained far more insight and wisdom than anything lost. Much of the petty, trivial and insignificant concerns I once had were no longer a thought in my mind. Having lived through good times and bad put real priorities in perspective and in general, for the first time maybe in my life, I felt content and was comfortable in my own skin. I may have added a few extra gray hairs, but also gained maturity and trusted my judgment. I took risks, though not the kind associated with youth. I took a chance on me and after 30+ years decided to go back to school and earn my degree. In 2006 I received my associate degree, with honors and since then have been working on my bachelor degree in English-Professional Writing, also as an honors student.